Hey folks, Valkor here. When you've had enough of getting head shots off your friends, (or Koreans who are the new Japanese when it comes to gaming) in FPS flavor of the month, or saving the princess from demons and dragons, why not settle back with SouthPeak's latest game "Sushi-Go Round". It's a fast-paced puzzler that's loads of fun and it'll make you hungry at the same time. 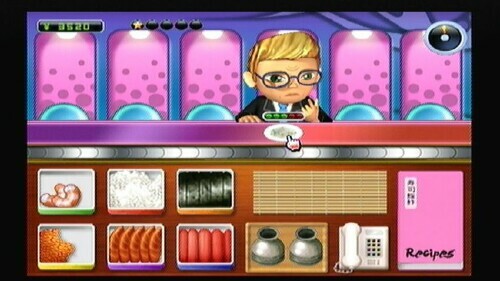 Sushi-Go Round has several modes of play, but in the main story mode, you play as a young lad who wants to impress this hottie. So he decides to open the bestest sushi restaurant ever. And with the assistance of a little old sensei, you'll attempt to do just that. Customers of all varieties will enter your restaurant and it's your job to complete their order in good time or else their out of there with the quickness. 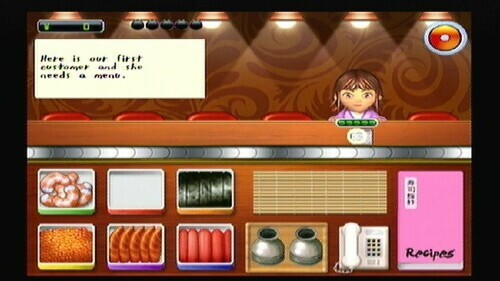 When they enter the shop, you have to quickly give them their menus and get ready to prepare their orders. Below you're given six items – rice, salmon, nori, seaweed, shrimp, and fish egg. Plus you also have Sake, if the order will take a bit longer, that way the customer stays happy and they won't leave. Once the customer is ready to order, an image of what they want will appear next to their head, which you must then proceed to make said order. If you're not sure just how to make it, there's a recipe book that will guide you on how to make it. You use the Wii-mote (no chucks this round) to snag the items you need, place them on the mat, and with a quick swipe it will automatically prepare the item and send it on its merry way to the customer. But if you get it wrong, you'll get a plate of slop that no one will want and you'll waste money. If you run out of items you can quickly order some up by clicking on the phone and depending on how far ahead or behind you are on orders, you can order normal, which is free or you can have it expressed which will get you your items faster, but will cost an additional 50 bucks. And don't forget to clear the dirty dishes! You're goal is to make a certain amount; if you fail to do so, don't despair, you'll get three tries to get it right. If you succeed you move on to the next day, until you reach your goal. As you progress, the orders get more complicated, the customers pop in faster, and to throw a monkey in the works, every four days, after the last customer has left, you'll get a special customer or boss character that'll order more than one item and you have to please them. Do it and you'll gain their kudos. But if you don't please 'em, then it's FAIL. If story mode isn't workin for you, the game has several other modes to try such as Multiplayer (vs. game) to see who can make the most money, my personal favorite "Forbidden Mode", where you can't serve a certain item no matter what. And the game will flip the script on you too, so watch out. 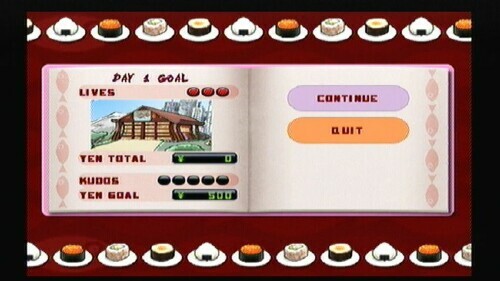 You then have Endless Day, where you just keep servin up sushi all day long, with no time or day limits. It's like an endless practice more. Next is "time attack" where you try to beat the highest score. Then there's Endurance mode, where you have to serve customers without anyone walking out. And finally there's puzzle mode, where customers will just pop in ordering items, and you have to keep dishin out the goods. 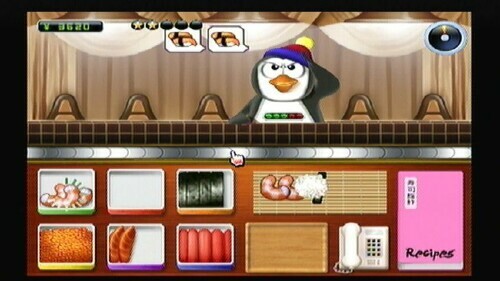 Are your wrists ready to handle what Sushi Go Round has to offer? First and foremost are the graphics - simple yet very effective. 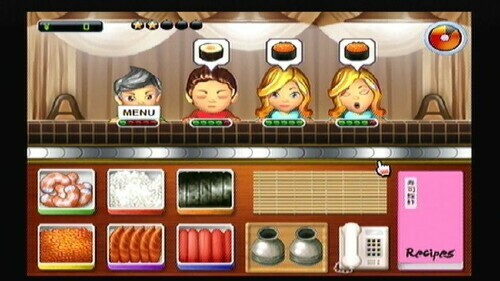 Colors are bright and the onscreen images are sharp, plus the cartoon presentation of the food looks like the real thing. 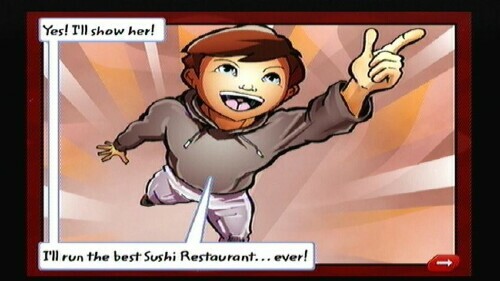 The customers are very cartoony, each with their own little attitude, with some nice animation to boot. And as I stated in the beginning, the game is fast-paced puzzler that's just so addicting and loads of fun to play. Nuff said, I had a blast checkin this game out. The music, which is quite repetitive and loops something fierce. Honestly you can play this game with the volume off or adding your own track (though you can't do it in-game), since the game uses no sound cues. The messed up plate when you don't make a dish properly. It's just a pile of mush. Heh. 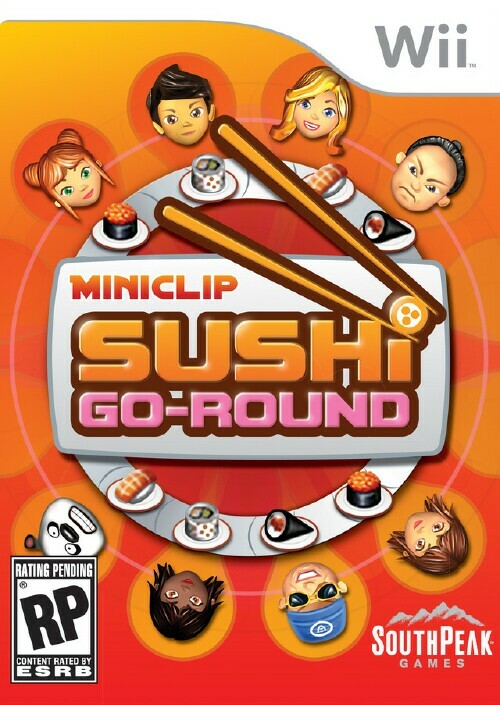 If you're a fan of the Diner Dash series, then Sushi-Go Round is a definite must own, because it's essentially the same game, but its sushi you get to play with. Fast-paced, addicting, and fun; what more could anyone ask? I enjoyed it and I know you will too. And out of TOV 5 stars, I give SouthPeak's Sushi-Go Round 4 stars. And it's been Valkor tested and TOV Approved!